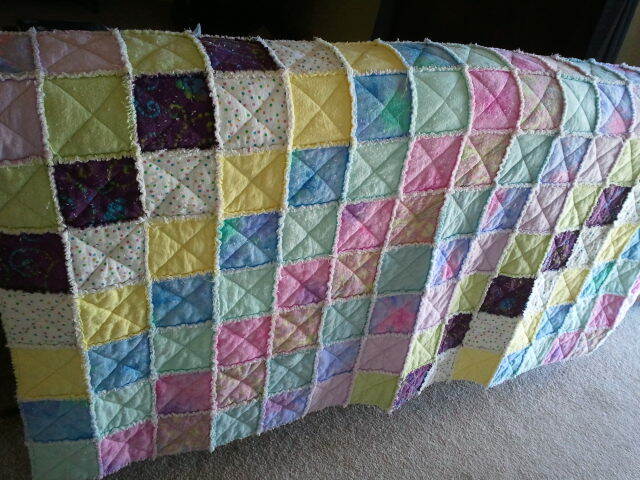 Then of course I move across the country so Mom isn't even there to help me fumble my way through making quilts. Along comes Pinterest. How did I ever survive without it? This pin rekindled my desire to make a rag quilt. I looked for bolder colors but have very limited fabric stores near me. Oh, I have Walmart and Hobby Lobby. Both carry mainly pastels. I had 11 colors, 1/2 yard each. I was able to get 21 6" blocks from each 1/2 yard. I cut them all up. I looked up charts to see how many blocks I would need to get different size quilts. 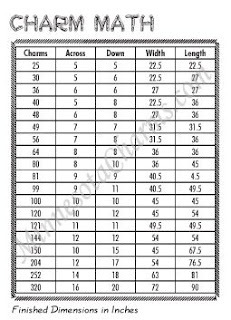 The chart is for charms which are 5" and my blocks were 6". I ended up with 11X15 blocks. But I didn't have enough for the back! I did some math and ran out and got white flannel for the back blocks.The tutorial says you don't need to be fussy cutting the material, that you can fold and cut. I suggest cutting a little more exact and use a walking foot on your machine. It makes a world of difference from having to go back and catch missed stitches when you are done. I cut out a couple hundred 5 inch squares of batting which were not perfectly cut. But they really didn't need to be. To make the X on each of the blocks I went the same direction through one stack of 11 colors. I clipped them apart and then went the other direction. I tried making individual X's but it was very time consuming. 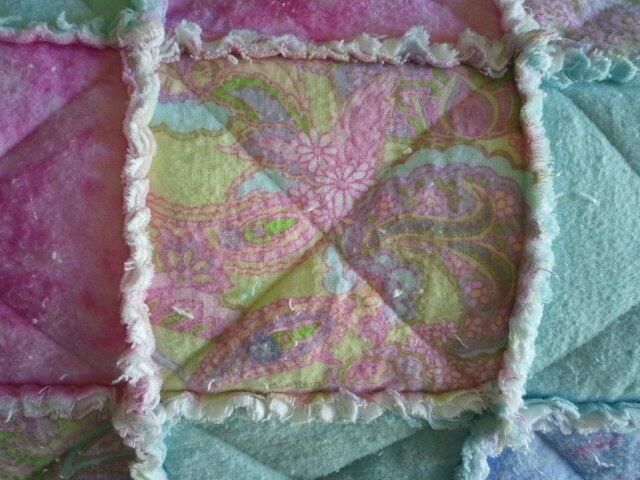 I also pinned my layers of fabric and batting on two sides just to hold it in place. I started out using a regular 1/4" presser foot but it was bunching. I took the couple of minutes needed to switch to the walking foot and it was so much better and much more even. Now, I have to tell you. 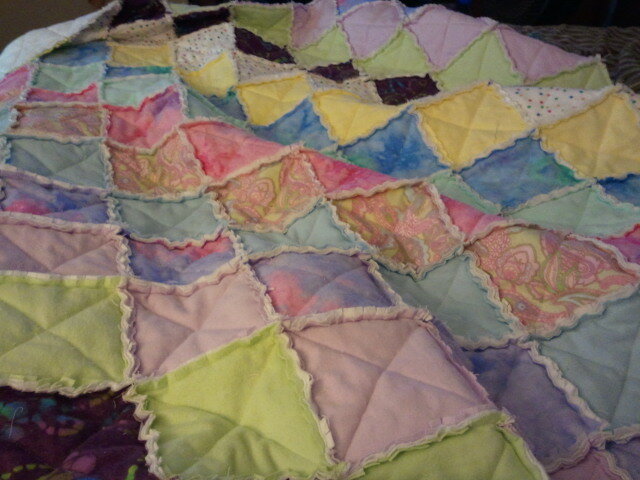 This quilt is quaint and pretty but it is HARD WORK!!! I imagine it would be hard for a young healthy hand but throw in some age and some arthritis and it is painful! If that is you I suggest making this one slowly and not be rushed to have it finished like I did. 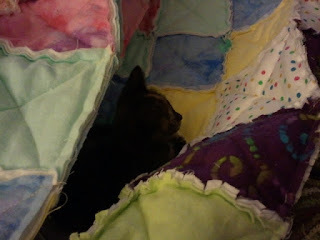 Here it is as I'm clipping, I did have quite a bit of help with all the little critters thinking it was their new bed. They sure got angry with me when I had to rotate it. My sweeties 1 pound kitten, Emma. She's so sweet but still a trouble maker. It took me about six hours to clip. I took a lot of breaks and rested my hand so it probably really didn't take that long. Did I mention flannel is 'dusty?' Yep, sneezed the entire time. And then...I really thought I was so careful to not clip through any seams but when I looked at it before the dryer there were places that had separated. 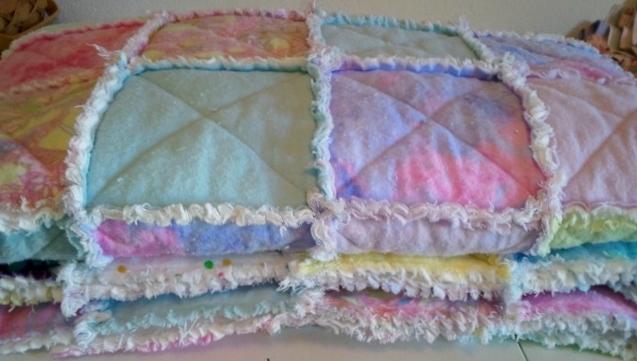 So wet quilt in hand I fixed the few errors before the dryer. I didn't want to take a chance that the dryer would make it irreparable. I shook it out some more to spare the lint trap in my dryer. I then checked the lint trap every 5-10 minutes to make sure it wasn't getting clogged. SO MUCH LINT! All in all it was worth it. I still love the way it looks and the oh so soft and cuddly thickness. 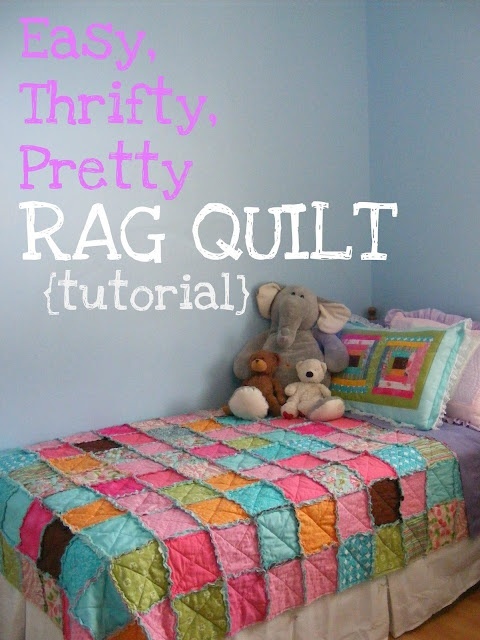 If you check my pinterest board for quilting you will see lots of ideas for rag quilts. Yes, I will be making more. No, I won't rush myself next time. Whenever it's done, it's done. I am also going to make bigger blocks. 8-12" I haven't decided yet. I'm also going to get a smaller pair of Fiskars. I'm pretty sure I dulled the tips of mine too much to do another quilt without sharpening and they are the full size. I think it's the reason I hit the seams a couple times. Here is a video that might help you out too.